What is a co-op? why should I shop there? A co-op (short for cooperative) is a businesses that is owned and controlled by the people who use it. We have created a whole page to answer this question in more detail. Click here to check it out! Do you accept SNAP benefits? Yes, we proudly accept SNAP benefits (also known as Food Stamps or EBT). We even participate in a program where you can use your SNAP benefits to get free local produce. Click here to learn more. Do I have to join to shop at the store? Everyone is welcome at the Co-op and Member-Ownership is not required to shop. While Member-Ownership is not required, joining the Co-op gives you a unique opportunity to support and collaborate with your local community. What are the benefits of being a Member-Owner? 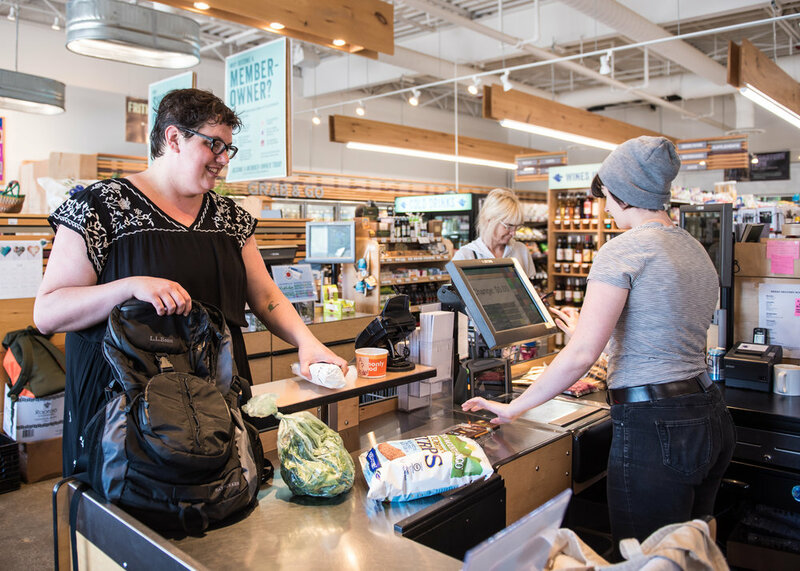 By joining the Portland Food Co-op, you are helping to ensure the success of our locally-owned grocery store that provides you and the entire community with access to high-quality local, natural, and organic food and household products. The store can’t succeed without your support! receive a patronage dividend when the Co-op earns surplus income. How do I become a Member-Owner? You become a Member-Owner by purchasing an equity share, which is a one-time equity investment in the Co-op. The cost of a share is $100 (or $10 for low-income individuals). We also have a payment plan available broken down into 4 quarterly payments of $25 each. This is not an annual fee. Once you buy your equity share, you are an owner of the business and get a vote in decisions brought before Member-Owners. A printable version of the enrollment form is available online. It is also available in the store. Ownership is open to any individual 18 years of age or older. Cooperative and non-profit organizations, who wish to make purchases for use or consumption by the organization, may also join. We have payment plans and low-income options for becoming a Member-Owner to ensure that ownership is accessible to everyone. Everyone can shop with no work shift or volunteer expectation. If you are interested in volunteer opportunities to support the mission of the Co-op, please reach out to our Marketing & Community Engagement Coordinator at marketing@portlandfood.coop. Is Member-Ownership for an individual or a family? Member-Ownership is individual. The Member-Owner and any member of his or her household may make purchases from the Co-op on the terms available to that Member-Owner, which includes receiving Member-Owner sale prices on designated products. However, it is only the individual Member-Owner who may vote in elections and run for the Board. Cash, checks, credit/debit cards, and SNAP Benefits (according to state guidelines) are accepted for all product purchases. To purchase an equity share, we accept cash, checks, credit/debit cards, or money orders. Proof of assistance is required for purchasing an equity share using the low-income option. Email info@portlandfood.coop for more information. Please note that SNAP benefits (also known as Food Stamps or EBT) may not be used to purchase an equity share. How do the payment plan/low-income options work? To ensure that ownership is accessible to everyone, the share may be paid in four quarterly installments of $25. You will receive the full benefits of Member-Ownership from your first payment. If you are receiving public assistance, your equity investment is reduced to $10 for as long as the individual receives that subsidy. Government assistance includes: SNAP Benefits (also know as Food Stamps or EBT), Supplemental Security Income (SSI), Medicaid, WIC, General Assistance, Family Health, and Section 8 Housing. To activate the low-income option, the Member-Owner provides a copy of their eligibility letter from DHHS (or the municipality if receiving General Assistance) with their Member-Owner application. To purchase an equity share using a payment plan or the low-income option, please print out this PDF and mail it to 290 Congress Street, Portland, ME 04101 along with a check and for the low-income option, a copy of your letter of eligibility from DHHS or your municipality. Is my Member-Owner investment refundable? What are the rights and responsibilities of a Member-Owner? Co-op Member-Owners invest in the Co-op to support the viability and growth of the cooperative. Each Member-Owner is a stakeholder in the business and is entitled to the voting and decision-making rights as outlined in the Bylaws and as determined by the Board of Directors. This includes voting in Board elections, running for a position on the Board, and voting on other important matters. What is a patronage rebate? A patronage rebate distributes the Co-op’s excess profits to its Member-Owners in years that it generates more profit than is needed for healthy operations, staff compensation, and loan repayments. The amount of the rebate is proportional to the amount of purchases the Member-Owner made from the Co-op that year. Will my equity share change in value over time? Your initial equity share will not change in value and does not bear dividends. Where will my equity money go? Equity money is used to support the growth and viability of the Co-op. Board meetings are held at 409 Cumberland Avenue on the fourth Tuesday of each month, from 7-9 PM. All Member-Owners are welcome to attend. Please always check the Co-op calendar to ensure that a Board meeting has not been moved or rescheduled. If you would like to speak at a Board meeting, or if you have any questions about the Board, please email board@portlandfood.coop. Email us at info@portlandfood.coop and we'll be happy to assist you.